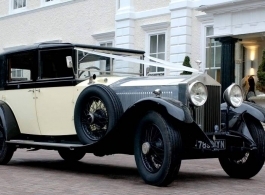 1929 Rolls Royce Phantom wedding car. This vintage series 1 Rolls Royce Phantom from the 1920's is known as the Sedanca de Ville - a model that allows for the front (drivers) cabin to be open whilst the rear passengers stay covered and protected from the elements. The Beige leather interior and walnut trim is very traditional and there is a glass partition between the front & rear. This Rolls Royce seats 1 passenger in the front and up to 5 in the rear with the use of 2 fold away seats although the fold away seats are more suited to smaller/younger passengers.